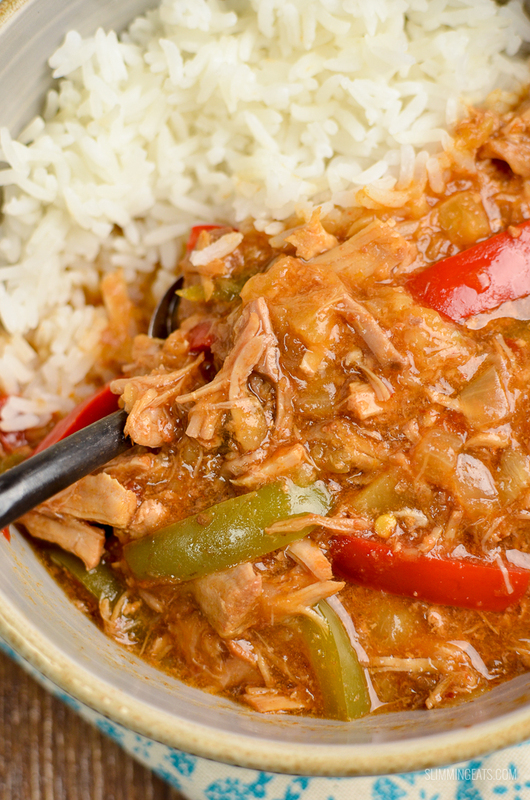 Delicious Slow Cooker Pineapple Pork with the sweetness of crushed pineapple, the spicy kick of sambal oelek, plus soy sauce, maple syrup and red and green pepper. Perfect with rice or noodles. You can never have enough Slow Cooker recipes in my opinion, especially when you know you have a busy day ahead and when you know the last thing you will feel like doing at the end of the day when you get home is to stand at the stove for a half an hour or longer cooking up something for dinner. 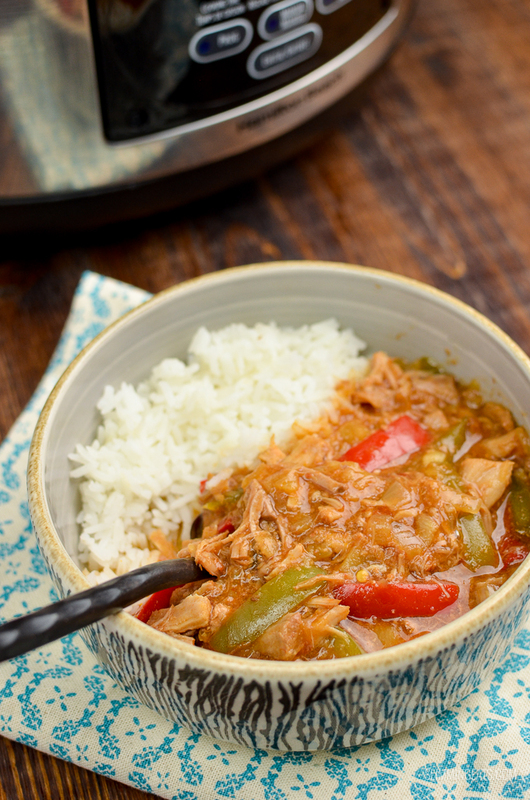 That is where crockpot recipes like this Slow Cooker Pineapple Pork come in really handy, you can prep everything in the morning (or even the night before and keep in a tub in the fridge) add to the slow cooker, set it on the desired timing and set off on your way knowing that when you get home a delicious healthy meal will be waiting for you. 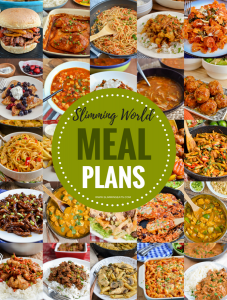 I often make extra when I cook something in my slow cooker too, as there is nothing better than having leftovers to freeze, I often set aside a batch cooking day here and there, especially if I know I have a busy week ahead. If you have some friends who want to share the work. Organizing a batch cooking day with friends is a great way to make lots of yummy meals with half the chore. Plus it’s fun too when you have some good friends for company and you will be surprised how many more meals you can get cooked up in one day. 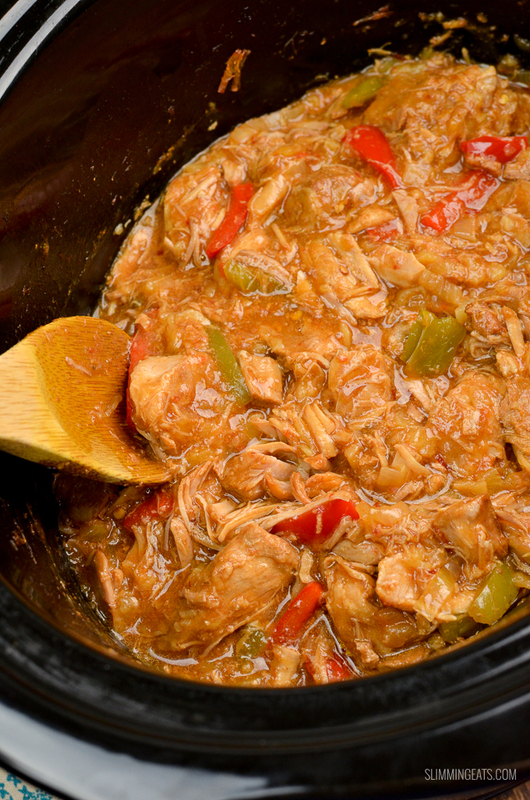 Most tend to use their slow cooker in the winter rather than the summer, but really it is ideal to use any time of the year. 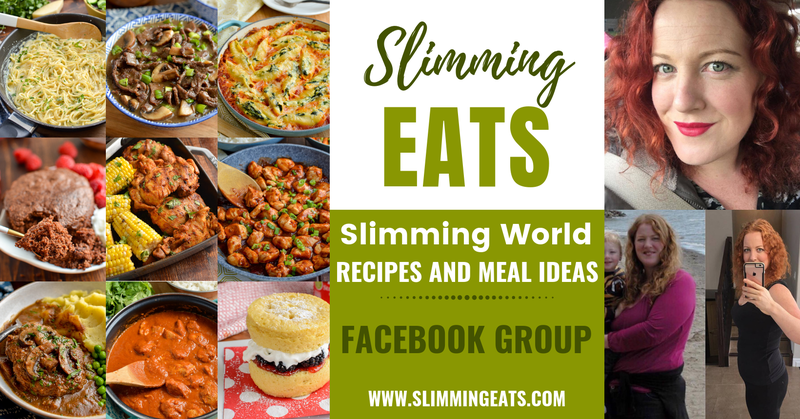 or head on over to my FULL RECIPE INDEX for over 700+ delicious Slimming World recipes. When you are buying a slow cooker, it’s always worthwhile bearing in mind the features it may have. Choosing one which allows you to use the inner pot as a searing pot can come in really handy when you want to sear the meat or vegetables prior to cooking or you want to add some starch to thicken your sauce afterwards. 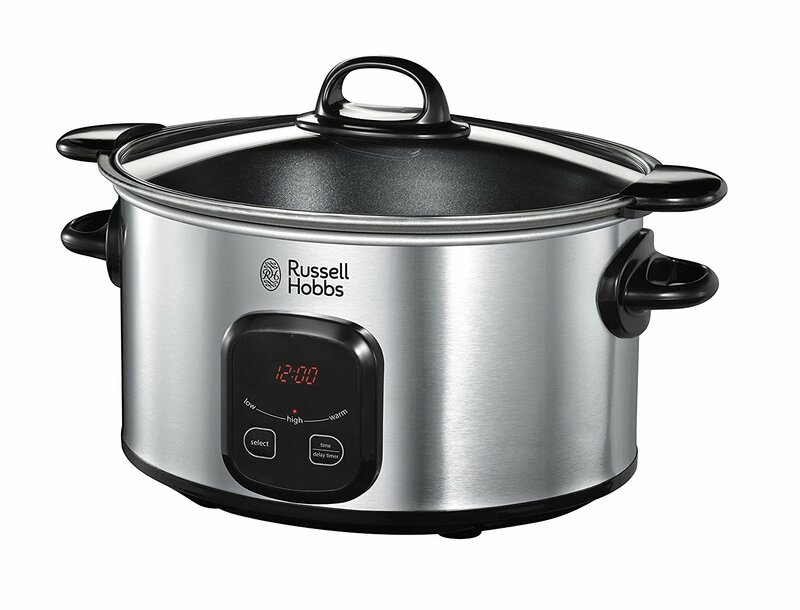 This Russell Hobbs Digitial Slow Cooker has those features as mentioned above as well as a digital time, with low, high and keep warm features. 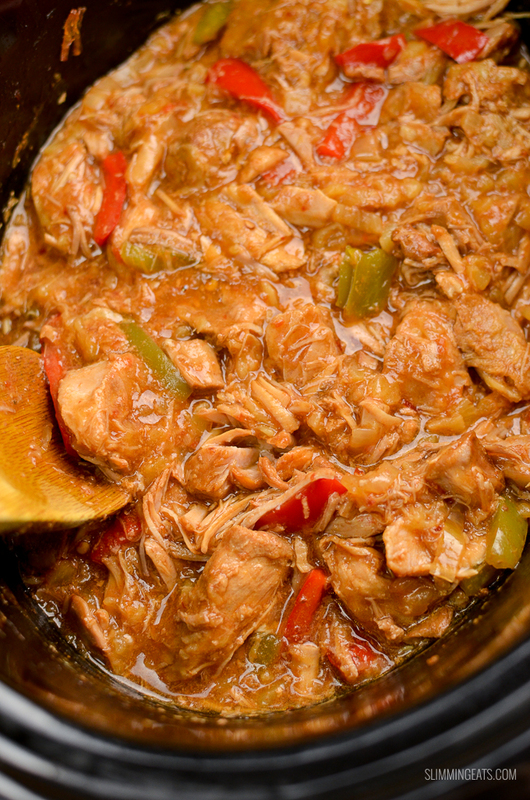 HOW CAN I ADD A 1/3 SPEED FOODS TO THIS SLOW COOKER PINEAPPLE PORK? 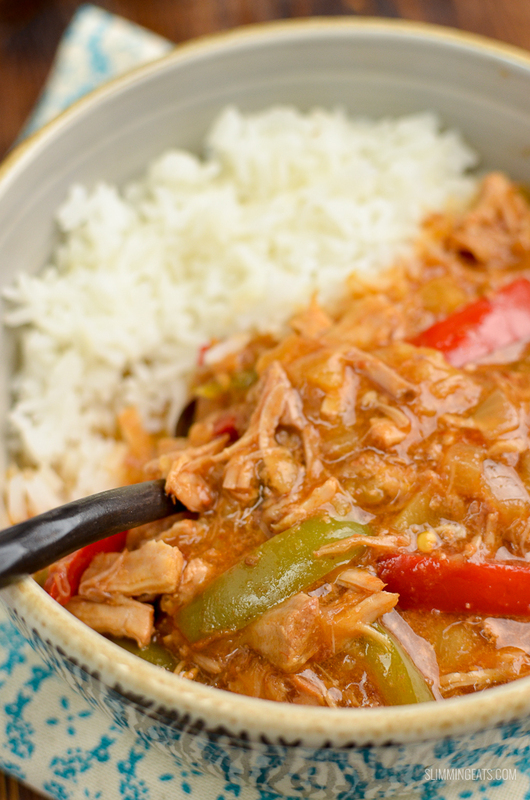 There are already peppers and onion in this Slow Cooker Pineapple Pork, but add some more speed foods by serving it with some additional stir-fried vegetables along with your rice or noodles. Mushrooms, bean sprouts, baby corn etc would all go really well. You could ever skip the rice or noodles and serve with some Roasted Cauliflower Rice or Spiralized vegetables. Add the crushed pineapple, garlic, ginger, sambal oelek, soy sauce, tomato paste, maple syrup and water to a bowl, and whisk to combine. Add the pork and onion to slow cooker, pour over the top the sauce and mix. Add lid and slow cook for 5 hours on high. Mix the cornstarch with a little water to make a slurry. Add this into the pork, along with the red and green pepper. Add lid and slow cook for a further 1 hour on high. Season with salt and black pepper as needed. Hi there, you should be able to get sambal oelek at most large grocery stores, it is also available on Amazon. But as a replacement chilli flakes should work okay, you won’t get quite the same flavour, but it will still add the kick. How spicy is it please? It looks delicious, but my kids are quite fussy about eating anything spicy. Hi Jenny, I would just leave out the sambal oelek if they don’t like spicy. It’s not overly spicy, but does have a slight kick. Hiya can you do this in the pro king cooker? If so how long do you think it would take? Hi Ashleigh, I think it will work perfectly in a pressure cooker, however without testing it myself I can’t be definite on timing, but my first try would be 15 mins, allow the pressure to release naturally, and then switch to saute mode and add in the cornstarch slurry stirring till thickened. Add the peppers in at the beginning with the pork. Hi would you be able to use fresh pineapple instead of canned pineapple to save on syns? Hi Samantha, using fresh won’t reduce the syns unfortunately, as it is still cooked in the recipe and only fruit which in it’s raw form will be syn free. I can’t say how fresh pineapple would work in this recipe, I don’t think it will yield the same result because canned pineapple is part cooked in the canning process. Do you think this would work by replacing the meat options with some sort of beans or lentils to make it suitable for vegetarians? And if so which do you think would work best? Hi Emma – I can’t personally say without testing. White beans with some butternut squash or sweet potato might work really well.